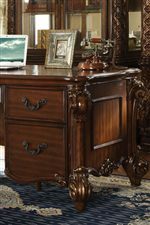 Use this traditional style double pedestal desk to update your home office. Five drawers provide convenient storage for papers as well as various office supplies. 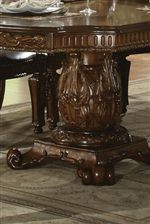 Carved details along the legs and sides as well as bail drawer pulls and a Cherry wood finish complete the look. Use with a traditional style office chair to create a room perfect for working. The Vendome Double Pedestal Desk with 5 Drawers by Acme Furniture at Carolina Direct in the Greenville, Spartanburg, Anderson, Upstate, Simpsonville, Clemson, SC area. Product availability may vary. Contact us for the most current availability on this product. Case Detail Carved wood details on table edges and chair legs. The Vendome traditional collection celebrates palatial elegance and traditional design elements. A cherry wood finish is found throughout the collection, making the pieces warm, rich, and inviting. 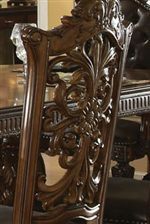 Heavily carved motifs on the leg and pedestal table bases are reflected in the chair backs and on the panels of the matching curio cabinet, hutch and buffet. 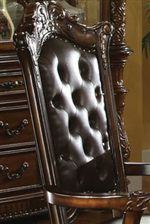 Accents like nail head trim and a button tufted arm chair back give the collection an opulent touch of splendor. Upholstered living room furniture has beautiful exposed wood that also boast carved motifs. Antique style hardware complete the stately look, helping this collection feel as though you've taken a step into the luxury and lavishness of the past. Use pieces from this collection to update your living room, home office, dining room or bedroom. 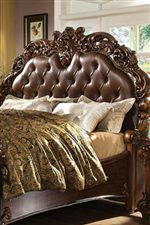 The Vendome collection is a great option if you are looking for Traditional furniture in the Greenville, Spartanburg, Anderson, Upstate, Simpsonville, Clemson, SC area. Browse other items in the Vendome collection from Carolina Direct in the Greenville, Spartanburg, Anderson, Upstate, Simpsonville, Clemson, SC area.